I'd love to introduce you to the Anachronic Jazz Band. If you've never heard about it I'll give you some information. It's a French band, that performed and recorded some albums in the 1970s. They are a traditional jazz band, featuring four horns and a five piece rhythm section with sousaphone and string base. 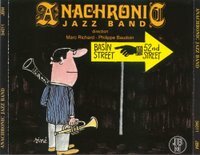 So far not so different then other traditional jazz groups, but .... what makes it Anachronic Jazz Band so different? The idea is very simple. The play melodies and sometimes the chord structures of bop tunes, making the 1940s and 1950s modern tunes sound as if they were recorded in the 1920s. This gives a very special effect as if the musicians are the wrong persons in the wrong time. Although in the 1970s their must have been a much larger gap between traditional and m,odern jazz styles, the music still sounds as a Roman soldier walking through Manhattan. Sad to say, but the band don't exist anymore and there are only few recorings left. Of course, some musicians are still active, but don't have plans to reissue the recordings again or set up a new Anachronic band. One of the musicians is the well known French trombone player Daniel Banda is now active in the Paris Washboard band and Daniel Huck is to found in the Petit Jazz Band de Mr. Morel. If you've never heard this music now there's a change. Enjoy their interpretation of Blue Monk , a well known Thelonious Monk composition. What a thrill to listen to this great French band. The rendition of 'Blue Monk' supports the impression that Monk knew his Morton. Or was it the other way round? I agree wholeheartedly about the joys of the Anachronic Jazz Band. I heard Joy Spring on Jazz Record Requests and fell in love with them immediately. 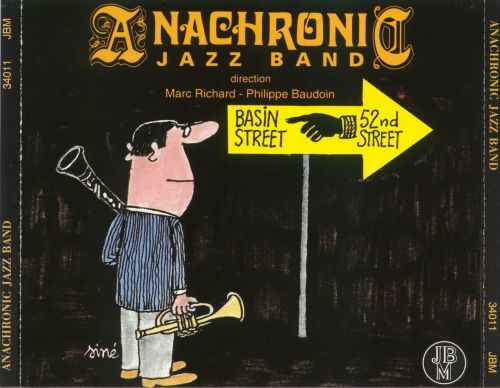 I heard - and taped the Anachronic Jazz Band in Nice in 1977, and it sounded GREAT! A few years ago I heard the trumpeter Patrick Artero in Breda, and he played even better than in 1977. He made a wonderful CD with the American pianist David Paquette.